Today I came home to this lovely item waiting for me in my mailbox. 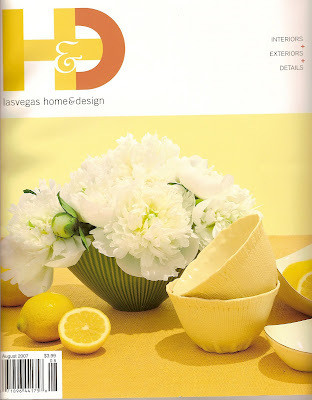 A beautiful feature in Las Vegas Home and Design Magazine! 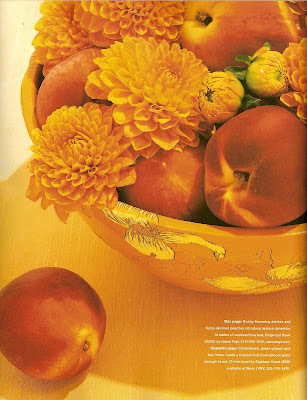 It's shiny glossy pages, featuring my Dogwod Bowl spread out across the page, over flowing with ripe peaches and luscious dahlias, back lit, golden and glowing like a centerfold. Oooooh it made me feel just a little naughty and well geez...a little bit like a starlet. (clay geeks like me feel this way when they see their goods on the pages of fancy pants magazines like these.) They didn't even airbrush out any supposed flaws...Well that's because there aren't any... As many of you might already know this bowl is perfect as far as I am concerned. It looks like Las Vegas Home and Design agrees. I think I can stand upright again. My legs ached for a couple of days after the sale from standing in one spot for two days. Sales are great but as many of you know they are exhausting on many levels. The show however was a great success and I couldn't be happier. I had exciting flurries of customers and visitors at my table throughout the weekend and many of my pieces walked away in other people's hands and off to their new homes. Most exciting was selling this piece, the largest item I have ever made. It is going to live in a beautiful home in Napa Valley. The Association of Clay Glass Artists sales are always a joy to do. The customers are knowledgeable and very interested in ceramics and glass so it a pleasure to talk to people about my work (and be a clay geek) and feel understood. This weekend I teach my workshop, Printmakers Clay Tiles, at Heath Ceramics . It looks like the class is full but if you are a last minute kind of person I think they may let a few extra folks in so don't be shy about trying to get in if you are interested in taking it. I am looking very forward to the workshop and can't wait to meet some of you readers who I know are taking the class. I have a couple of guest blogs lined up and will get back into the swing of posting them after this weekend. I also have a very special house guest (my sweetie) at the moment so I may be a little distracted for the next couple of weeks. Thank you all for your well wishes for a great sale. They all worked and boy was it nice to come home and read them at the end of my long days at the studio. Thank you, Thank you!! The calmness of this image is deceiving. I am using it on purpose to psyche myself out into believing I am calm. I am calm, actually, though a bit overwhelmed with all the little stuff that needs to get done for this weekends sale. Craft sales are like playing "store" for a weekend. Imagine starting up a brick and mortar business from scratch for just two days. That means, build the building, make all the stock for the shelves, make the shelves, set up all the business stuff, make sure you have all the bags and packing, price everything, set it up and then clean up, make yourself look pretty and become a shop keeper and be pleasant to everyone who walks through your door (even the not so nice ones) for two days straight, then tear it all down and pack it all up. Then go home and flop on your bed in exhaustion. It is a little intense but you get a kind of rush from it all. Momentum, it is all about momentum. I have to run now, have a building to build and a shop to set up! I will think about looking pretty tomorrow. Please come on by to the ACGA sale this weekend if you are in the area. I would love to meet you if I haven't already and if we have met then lets catch up! I have had the good intentions to post this weeks guest blogger (she has done her part...sorry Laura, I promise I will get to it) but I have been so darned busy getting things finished for the upcoming ACGA show that by the time I get home I am so tired I can barely see straight. I have not had a day off in a week and a half and the days have been very long... a twelve hour day yesterday and ohhhh, a short day today, only ten hours. Being an independent artist means I get to celebrate independence day by eating my lunch by the glowing kiln instead of by a glowing barbecue. It's okay, I am almost there (I whisper this to myself many times through out the day) and just look at the cacophony of color! Just to toot my own horn a little, this is about half of what will have for the sale. The vases go in the kiln tomorrow and some bigger "show" pieces also get fired tomorrow. My back aches and my shoes are covered with glaze, I am tired but feeling very satisfied.